Tickets can be purchased at any train station, including Zurich airport. 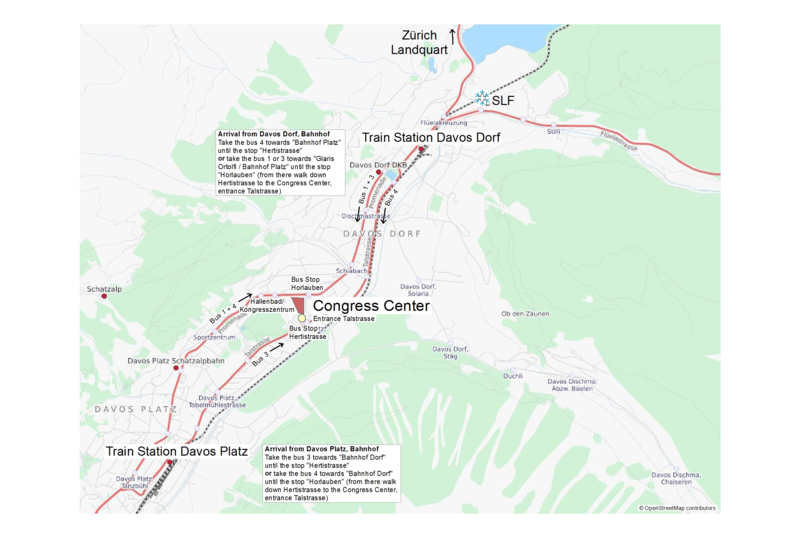 From Zurich, you have to connect in Landquart with the historic Rhaetian railway (RhB) and travel on to Davos. take the bus 4 towards “Bahnhof Platz” until the stop “Hertistrasse”. or take the bus 1 or bus 3 towards “Glaris Ortolfi / Bahnhof Platz” until the stop “Horlauben” (from there walk down Hertistrasse to the Congress Center, entrance Talstrasse). take the bus 3 towards “Bahnhof Dorf” until the stop “Hertistrasse”. or take the bus 4 towards “Bahnhof Dorf” until the stop “Horlauben” (from there walk down Hertistrasse to the Congress Center, entrance Talstrasse).